The first novel based upon the award-winning WARMACHINE® steam-powered fantasy wargame and the world of the Iron Kingdoms® Role Playing Game is an action-packed steam-tech fantasy that combines elements of epic wartime adventure with thrilling cloak-and-dagger espionage. The Iron Kingdoms are at war--a war fought with machine guns and magic, knights of valor, and earth shaking titans of steam and steel. And now that war may hinge entirely on nothing more than a sheaf of papers. An alchemical formula, stolen by an ally they thought they could trust, could cost the brave soldiers of Cygnar everything. Their only hope: a cunning spy, a knight out of her element, and a frighteningly small unit of the best that Cygnar has to offer. Arrayed against them is not only a single, devious enemy, but the combined intelligence apparatus--and possibly the full military might--of the most brutal martial power Cygnar has ever known. © 2001 - 2013 Privateer Press, Inc. All Rights Reserved. Privateer Press, Iron Kingdoms, WARMACHINE, and their logos are registered trademarks of Privateer Press, Inc. Used under license. "If you're a fan of dark, gritty military fantasy, [this] is the book for you. 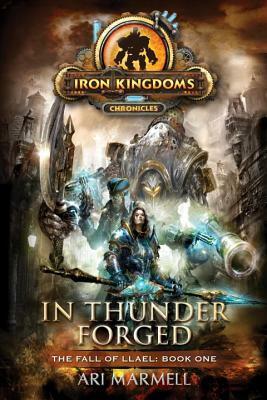 Ari Marmell is a superb writer, and he's at the top of his game in this first volume of The Iron Kingdoms Chronicles.... Fresh and different. And highly addictive." "Marmell’s characters are memorable and compelling, and his creativity and originality within the steampunk fantasy genre makes him a remarkable storyteller. This one is a keeper."